As I get older, I find that it is harder to remember things -- names are the worst. In doing my trip write-ups, I rely on photographs to remind me of where and when. On Day 2, I took the photo below at Notre-Dame; but it was on Jon's camera, so I lost the memory until a couple of days ago. At lunch on Day 2, Jon mentioned that he received an e-mail from his brother, who unbeknownst (love that word) to Jon was in Paris at that moment. 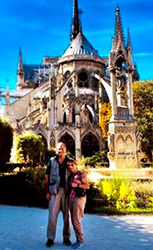 The e-mail included a picture of Jon's brother and his wife in the garden of the cathedral with the apse in the background. Jon thought the best reply would be a picture of Julie and him in the same spot. So off we went to the Cathedral of Notre-Dame de Paris, which was built on a site of a Roman temple in the 12th Century. In the 13th Century the flying buttresses, an important innovation at the time, which reinforce the structure, were added. These and the spire of the cathedral can be seen in the photo. The Spire is located over the transept and altar and was constructed in the 13th century. It deteriorated over 500 years and had to be removed in 1786. During the 19th century restoration, it was recreated and surrounded by copper statues of the twelve Apostles. 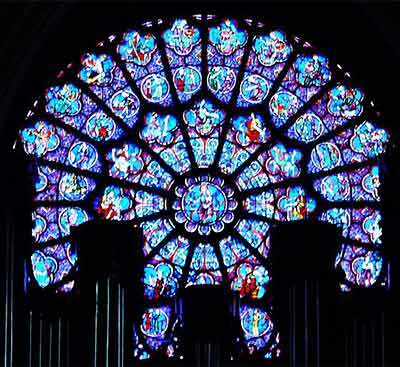 Notre-Dame is also famous for the three rose-stained glass windows. The first and smallest of these, in the west facade above the doors, is about 30 feet in diameter. It was originally made in about 1225 and was also recreated in the 19th century. The passage of time is tough, even on church windows of glass and stone. The four of us planned Day 3 in Paris at the petit déjeuner provided by the Hotel du Parc. Julie and Jon decided to visit the Musée d'Orsay, which Kathy and I visited on our last trip. 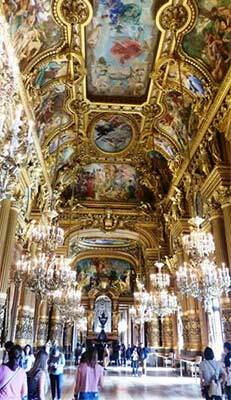 Kathy and I decided for a hop-on-hop-off bus tour and a visit to the Paris Opera House, the Palais Garnier. Day 3 was overcast and threating showers; undeterred, we walked to the Boulevard du Montparnasse where we got on the bus and bought passes. We needed to transfer to the Red Line at Place Vauban near the Army Museum. 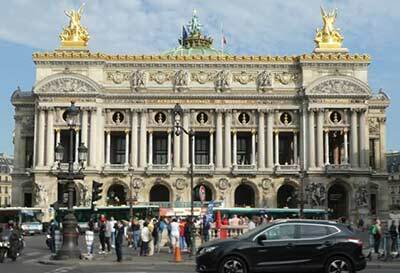 This second bus let us off one block away from the Palais Garnier. It is spectacular; we walked around the neighborhood to take it all in. 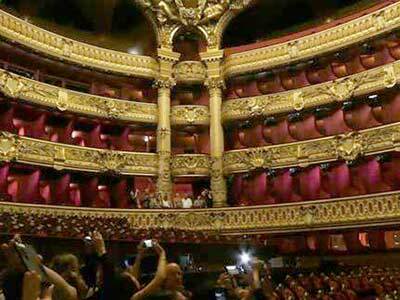 The Palais Garnier was completed in 1875 for the Paris Opera. This is the most famous opera house in the world, partly because of Gaston Leroux's novel The Phantom of the Opera, and its adaptations by Andrew Lloyd Weber into the 1986 musical. 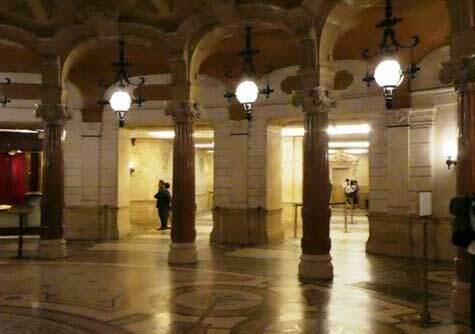 A water course and a huge concrete cistern were built under the Palais Garnier to relieve the pressure of excessive groundwater on the basement walls; this cistern became the lake in Leroux's novel. In September 1860 Emperor Napoleon III issued an imperial decree officially designating the site for the new Opéra de Paris. A design competition was held to negate the influence of the emperor's mistress on the selection of the architect. Charles Garnier's design was selected from the 170 submitted; and construction started in 1861, at about the time secessionist forces attacked Fort Sumter in South Carolina starting the U. S. Civil War. Work on the building stopped during the siege of Paris during the Franco-Prussian War, which resulted in the removal of the Emperor and the establishment of the Third Republic. An additional delay resulted from the turmoil of the Paris Commune that followed. After fire in 1873 destroyed the opera house, Salle Le Peletier, completion of Palais Garnier was ordered and finished in 1874 at more than double all previous costs. The theatre was formally inaugurated on January 5, 1875, with a lavish gala performance attended by Marshal MacMahon, the Lord Mayor of London, and King Alfonso XII of Spain. 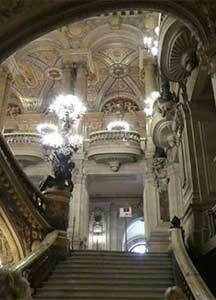 We entered Palais Garnier through a back door on the lower level, bought tickets and waited for our tour to start. There were about 60 people in this lower level entrance rotunda who were broken into three tours. 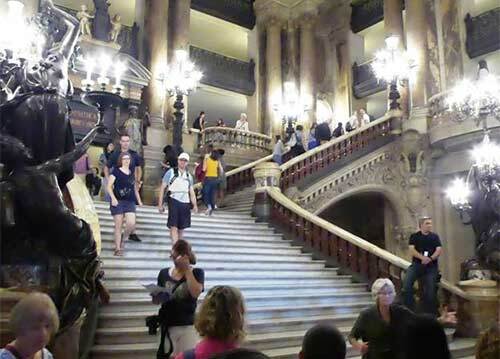 Each tour group went a different route through the Opera and did not interfere with each other. Our guide was excellent informing us on the history and some juicy tidbits. The rotunda was part of a carriage entrance that allowed the wealthy patrons to have their carriages drive right to the door, so they avoided having to walk on the streets. The rotunda became the first opportunity for them to see and be seen, which was one of the main reasons for going to the Opera. From the rotunda, our guide took us up the back stairs, the Grand Escalier, to the upper level. The décor is very ornate, and everything is allegorical, too many references to remember, but mention an ancient myth, story, legend or allegory, and it is represented there somewhere. The Opera has been continually upgraded since construction was finished; electric lighting was added in 1881, and the last remodeling was completed in 2007. It looks spectacular! We were taken into the theater and seated in the auditorium on the first level. On stage the stagehands were preparing for the presentation of a ballet. The stagehands are unionized; and we were warned not to make noise or take pictures, which would interrupt their sound checks and other efforts. The stagehands left the stage and everyone snapped away. The bronze and crystal chandelier designed by Garnier weighs seven tons and can be raised and lowered for cleaning and maintenance. In May 1896, one of the counterweights in the lifting mechanism broke free, fell through the ceiling, killing a concierge. This engendered the famous scene in Gaston Leroux's 1910 novel. 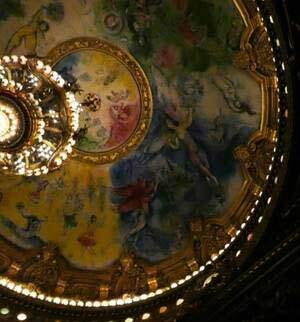 Careful examination of the ceiling above the chandelier shows the artistry of Marc Chagall. Our guide told us why the original had to be replaced, but I forgot. From our seats we could see back stage where the ballet dancers had dressing rooms. Our guide mentioned that in the 19th Century in France's male dominated society, the ballet dancers supplemented their incomes by the patronage of male attendees. From the auditorium, we went up to the Grand Foyer, a hall -- 60 feet high and 500 feet long -- designed to be the drawing room of Paris society. As mentioned all the decorations are allegorical: the central ceiling panel is Music, the oval panel at the western end is Comedy, the central oval panel is The Zodiac, and over-door panel, Apollo Receiving the Lyre. The Grand Foyer is flanked by two octagonal salons for more intimate gatherings. After the Grand Foyer we came down the grand staircase; much grander than where we entered. I turned to imagine the elegantly dressed members of French nobility and upper classes in 19th Century coming down the stairs, but there were only tourists in their usual garb. We went on to exit from the front door onto Place de l'Opéra. 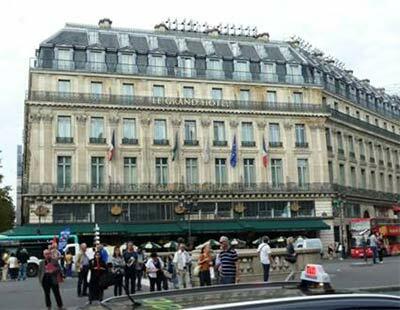 It was just beginning to sprinkle so we headed across street to the Café de la Paix in Le Grand Hotel. Just after we were seated in the sidewalk café, it started to rain. We were seated and had a leisurely lunch, which was very tasty and made even better by a glass of vin blanc. From our snug and dry place, we watched the people on the sidewalk outside try to huddle under the umbrellas projecting from the café to stay dry. We got off of the bus near the Arc de Triomphe and caught the Metro back to Montparnasse. We had a reason to return early; our train out of Paris was scheduled for 6:52 AM, and we wanted to reconnoiter the Gare Montparnasse. The front of the station was a chaos of construction with scaffolding and other barriers. We made our way into the main hall and found a SNCF (the French rail company) employee, who was very helpful and informed us that our train would leave from one of the first nine tracks and pointed them out to our left. We returned to the Hotel du Parc and put our feet up to rest before dinner. Going to dinner, Julie had a letter she wanted to mail, and we found no mailboxes at the hotel or on the street. We speculated that this was a security measure. 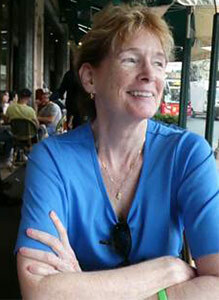 The hotel clerk told Julie that there was a post office on the Avenue du Maine, near the train station. We found the post office, but it was closed and had no deposit slot. We walked back a block to Le Petit Sommelier for dinner. We were early, and it was not crowded. When Julie mentioned her letter to the maitre d', he took it and went out and mailed it; there must be secret mailboxes known only to Parisians. We had an excellent dinner with a nice wine, which one would expect from the name. Then it was back to the hotel to pack, sleep and get ready to make the early train.